The Down East Dilettante has been very under the weather for the last few days, and will be back to posting as soon as the nasty medicines work their magic. In the meantime, a view of the iconic demi-mountain, just a few feet shy of the 1,000 required to make it official, that gives our village its name. The painting is by the artist formerly known as Fitz Hugh (now Fitz Henry) Lane, in the 1850’s. A few more buildings, a few more trees, a few more boats, otherwise the scene is unchanged today. Coming into the harbor by boat, the hill silhoutted blue against late afternoon sky, was always one of the thrilling experiences of my childhood, and in adulthood nothing has changed. It still takes my breath away—every time. Oh no! I hope you continue to feel better! Are you sure you're just not hung over still from the JCB& gentleman party? haha. You're in my thoughts! I shall FedEx some Jewish penicillin (Raina's Magic Matzo Ball Soup) over immediately. Fitz Henry, huh? 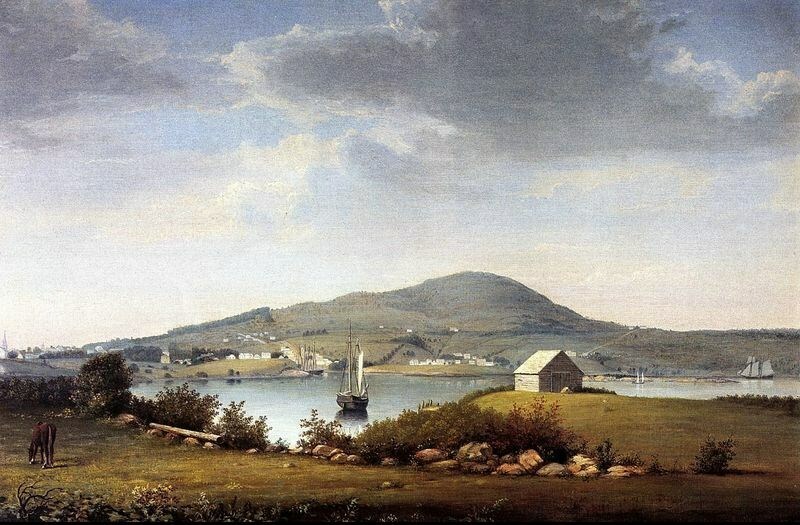 I wonder if someone got a PhD dissertation from that?Lane is one of my favorite American artists, along with Heade – both of whom did wonderful work along the New England coast. Bah humbug! First the car blows up and burns, and now your health takes a nasty turn. Wishing you a speedy recovery. You are right, the view of our "demi mountain" has changed very little. Thank you for this beautiful scene to enjoy while I am away.Hope you are feeling much better!!! Searching for that sense of continuity between past and present is always fascinating. Oh, do feel better! You must enjoy these waning days of summer.I really love that Lane painting. I have a little framed reproduction of it in my bedroom. A happy sight always. Hurry up and get better, and Bright eyed and bushey tailed..LOLWhen I go to the Farnsworth Museum I stand in front of Fitz Hugh paintings for 20 minutes can't get enough. I try to breath it in.Honestly, get better. C,mon DED, use your Science & Health, get rid of this nonsense, and get back to blogging. We miss you!!! I can't get the idea of a demi-monde under the demi-mountain out of my head. But presumably nothing could be further from that in your elegant part of the world.I hope your demi-health improves soon. Take it easy, old thing.